Kokawa (粉河) is one of the popular temple town located in Kinokawa, Wakayama Prefecture. Kokawa Temple was established in 770 and there are many traditional buildings in this temple. Around the temple, you can see the old town of a Japanese temple. The main hall is the 2nd largest building next to Todaiji temple. Also, it has a powerful dry rock garden. 1. use JR Wakayama Line to Kokawa Station. 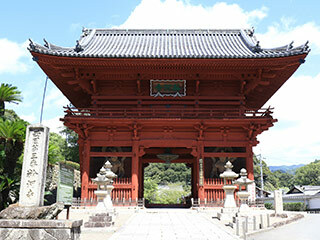 Kokawa Temple is one of the most popular temples in Wakayama Prefecture. It is located in Kinokawa, Wakayama. It was established in 770 and has been highly respected temple. Kokawa Temple is the 3rd temple of 33 famous temples of western Japan. There are many old buildings that are over 200 years old. You can see the great architectures of a Edo period. Also, the dry rock style garden was built in late Momoyama period (late 16th century). It has a dynamic art design of Momoyama Period.